October has been one hectic MF. I have flown through it, both metaphorically and physically. It has raced past me at a dizzying pace. It’s only now, as the dark begins to swallow the afternoons and the light actively retreats from this town, that I realise how much I would have loved October to stay a while longer. The clocks changing always feels like an ending of sorts. A chance to pause, reflect and appreciate something anew. I began this month with my head stuck firmly in an application for a big award that I’ve been nominated for. From there, I hightailed it straight into our first Team Effort! workshop. Despite most of us being loaded up with colds and flus, this was a wildly inspiring day. 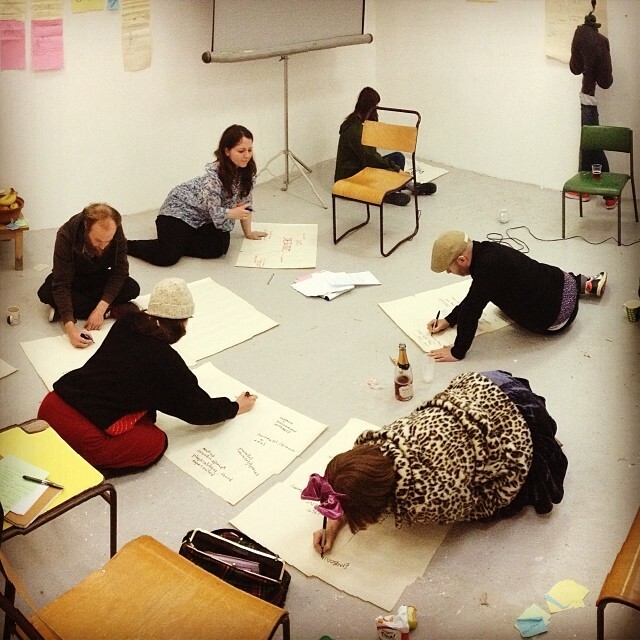 All nine of us together in Ben’s big, cold studio, watching each other’s video diaries, sharing our mix-tape pecha kuchas and scribbling stories on massive sheets of paper stuck to the white walls. We are a group now. Flexible, malleable and open, but a solid group nonetheless. We’ll do another two of these whole-group workshops throughout the year, reflecting on what we’ve done and imagining the things to come at each one. After workshop number one, I had two days to pack-quick before jetting off to Mexico to set up David Leddy’s audio play Susurrus. I was in Mexico for ten hectic but excellent days. I arrived home ready-set-go to jump right back into Team Effort!. I was itching to reconnect with the artists and to spend proper time dreaming up plans for them and getting balls rolling. I’m going to be absolutely honest. When Debbie told me she’d been offered the new job in London, my heart sank. It flipped, actually. It gasped, contracted, ballooned, burst and thudded into my belly. My first emotional response was purely selfish sadness. Pause. Big breath in. Big breath out. As Debbie’s soon-to-be boss would often say after moments of fear or confusion, “I had a meeting with myself”. Like the other five Team Effort! artists, Debbie has crafted this project with me since day one. Team Effort! has evolved around the needs, questions and ideas of the artists who inhabit it. Debbie is fearless when stepping up to new challenges and will always ask the questions that push her and her ideas further. When I told her in May that I was setting up a series of seven events over the summer called IF and asked her if she’d like to get involved, she set about exploring all of the different cultural and social connotations of the number seven. Her response to my simple invitation? She’d do all seven: seven different events with seven different collaborators. A challenge set to herself. A provocation. Another chance to push herself further, to feed her natural curiosity, to learn more. Debbie has dived head first into Team Effort! with generosity, openness, courage and intelligence. In two short months, she has become a co-conspirator, a fellow mischief maker, a trusted advisor and a valued friend to all of us. I have no doubt that she will do the same at the Royal Court and I couldn’t be happier for her or prouder of her. We will miss her deeply and feel the absence of her vivid, technicolour imaginings frequently. Debbie and I have agreed two things. The first is that she will maintain her involvement in Team Effort! as an Associate Artist. In quintessential Debbie style, she has requested that the others in the collective devise a provocation, a question or a set of challenges for her to respond to throughout her year in London. She will continue to blog on this site when she can, and she’ll continue to feed into the ongoing creative conversations that are beginning to flourish between us all. The second thing we agreed was that a sixth person should be invited to take her place in the team. That person should also have been integral to the evolution of the project and they should be bold in the questions they are asking of themselves and their practice at this point in their career. On Monday, I invited Eilidh MacAskill to become our sixth Team Effort! collective member and she accepted. We are all thrilled by the energy and experience that Eilidh will bring to the year. She has been fundamentally involved in Team Effort! from the outset: from experimenting with new work at the IF events to challenging my ideas for the project over a cup of coffee on the roof of the Studios. She is the perfect fit, and we are all thrilled to have her officially on board. And so. Off we go again, picking up speed and spinning off on tangents across the country. November will be one hectic MF. It will race past us at a dizzying pace. The days will get darker and colder. With the speed of it all, you could be forgiven for forgetting the one thing that is building gradually, solidifying as we go and strengthening slowly, adding permanence to everything we do. It’s in conversations over cuppas and “here’s an interesting article” emails. It’s in giddy giggles in the Glad Cafe and focussed afternoons of advice. It’s in the meetings we have together and the jobs we do away. It’s in Allan, Debbie, Eilidh, Fergus, Kim, Kim, Martin, Rose, Stef. So pause. Big breath in. Big breath out. See it? Now keep going.